Oral irrigators, more commonly referred to as water jets, make use of pressured water or mouth rinse for dislodging biofilm from spaces that exist between the different teeth, surrounding the gum margin as well as into periodontal pockets. Oral irrigators are also used by people using orthodontic appliances as well as those with dental bridges and dental crowns. There are two key advantages to using oral irrigators. First of all, oral irrigators help in cleaning the teeth conveniently because the water streams are able to get far back into the mouth as well as in-between the teeth. This happens because this device’s handles are based on the rules of ergonomics with angled nozzles that help in accessing every part of the mouth. Moreover, these irrigators only need 60 seconds for cleaning the teeth in all parts of the mouth. 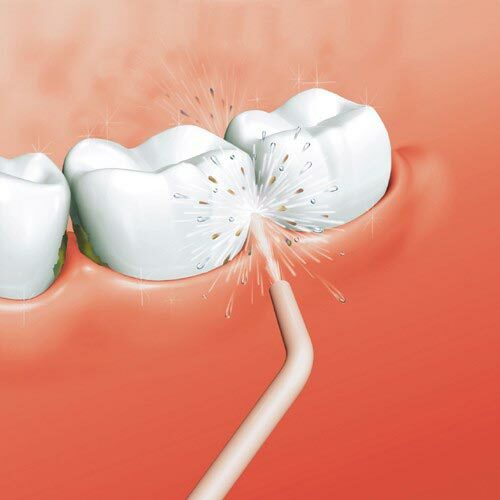 Another benefit associated with the use of oral irrigators is plaque removal. Research has shown that regular use of oral irrigators, when combined with daily tooth brushing, helps in removing around 99% more plaque than the use of a manual toothbrush alone. Moreover, constant use of oral irrigators can play an important role in improving gum health by around 93% while reducing calculus and gingivitis merely after two– four weeks of continuous use. According to experts, an irrigator’s pulsating action effectively clears dental debris as well as food bits in the mouth. While the water streams are un-invasive and gentle, the water jet’s targeted action tends to disrupt the difficult to reach parts of the mouth. A powerful miniature pump that transmits pulsating water streams by means of a plastic tip helps in sweeping away debris from over, between as well as under the teeth while stimulating gum tissue at the same time. All in all, oral irrigators are jet washes for the mouth that use pressurized water for cleaning bio-film as well as food debris from between the teeth. It is important to note that oral irrigators work great for individuals who struggle to clean their teeth with a floss or tooth brush alone. This variety usually includes powered units that have large water reservoirs for facilitating various uses. Typically, a flexible tube serves the purpose of connecting the reservoir to the irrigator’s handle. A variable setting or a button on the handle controls the water or mouthwash flow on the unit. This variety includes a re-chargeable battery that is equipped with a water reservoir designed into the handle. Compared to counter top varieties, these irrigators are equally powerful, but they have fewer power settings. These varieties work great for individuals who don’t have the convenience of shaver sockets in their bathrooms or those who travel frequently.